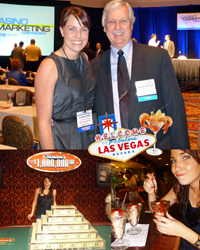 I was lucky enough to spend a few days in the USA recently with a large bunch of marketing executives for the Raving Casino Marketing Conference held at Paris, Las Vegas. Don’t get me wrong, it wasn’t all marketing fast-talk, I somehow managed to find time to fit in a shrimp cocktail eating competition in downtown Vegas and lose a few bucks in what should be called the ‘tightest slots in town’. Aside from bringing together gaming marketing professionals from properties around the globe, the conference produced some hard-hitting content, a lot of which hit close to home when considering marketing for our own gaming venues. It’s hard to distil two days of knowledge into one article, so here are 5 quick things I learned while mixing it with the best in the gaming business. The American players reflect many of the sentiments of our Australian gambling market. The discretionary leisure market has contracted; people are bringing less money and expecting more value and they are looking toward local venues to provide a source of safe, clean entertainment. One of the key trends from a group of successful marketing directors was failure. We have to work harder to maintain a relationship with our customers and the real challenge is what do you do after you fail (because you no doubt will at times). It’s comforting to know that we are already working with some of our clients to incorporate many of the marketing strategies discussed. What I loved was the aggressive nature at which the casinos market their services. After all, these guys are up against at least three times the amount of gambling competitors than we experience at home and if you can imagine all of the properties producing a monthly (sometimes daily) direct mail piece in the same local market – the competition for marketing cut-through is fierce. Think your little venue has nothing to offer compared to the big guys? If you look hard enough, there’s something to sell that nobody has and yes, people want it. The discussions surrounding technology and the use of geo-targeting and prediction marketing was running hot. Imagine being able to randomly give out prizes for people via their mobile phone just for visiting the gaming room of your venue? It’s instant, personal, effective and most importantly, possible. Social media has its place; however there was a lot of argument surrounding the value of investing in it when most venues aren’t effectively marketing their physical presence. Promotions that sing to your customers and have a bit of thought put into them were championed; lots of smaller winners, out-of-the-box ideas and relevant to your brand. The trend I saw in all of this was direct communication. Personalised and targeted direct marketing is still king and always has been. Loyalty programs are about delivering what your competitors are not. It appears that the USA is also susceptible to developing ho-hum loyalty schemes – “Dear customer, thanks for being loyal, here’s the same offer as that other place you like to play at. Because you’re special to us”. But don’t feel bad, it’s not just us – check out your local coffee shops with the buy 9 get 1 free offer. Who is being loyal to whom? The real challenge for marketers is to communicate value to the punters not points. Get the program set up professionally to avoid costly mistakes, leverage your sign-up experience so they know what to do, show them visually what the whole thing means and teach your staff to talk points like a second language. Oh, and in case you were wondering, I got to four shrimp cocktails and had to tap out to make room for a buffet dinner. I guess they don’t make ‘em like they used to. Thanks must go to Dennis Conrad and his team at Raving for inviting me to share in on this fantastic experience. If you require assistance with your marketing or have any questions about the conference, please contact me anytime.